My recovery is going very well. My pin is coming out of my finger on Friday. It’s been six weeks so far, and I’ll have to wait and see how much longer it will be from here. I have to be patient through the healing process. While watching the game from the sidelines is always frustrating, the rest has been really good. The only time you get to rest nowadays is when you’re injured. I won’t be at Loftus this Saturday, but will definitely be watching from my guesthouse. I prefer viewing the game from home, and plus watching it on TV, the angles are much better! While the Wallabies have never beaten the Springboks at Loftus, statistics prove something about the history, and are not necessarily an indicator to the future. I don’t think the Quade Cooper controversy is something the Wallabies can ignore; obviously, they have had their own problems to sort out. However, those issues are part of the game and I think the Wallabies will have focused on putting that behind them. Equally, I have no doubt the Springboks will focus on their own job. We are now back on home soil and hungry for victory. I think that the Boks’ focus point this week would have been on the importance of finishing off our opportunities. We have tended to create and not finish. Against the Wallabies, it’s key we capitalise on the opportunities we create and put them under pressure. While the forwards have been playing really well of late, we must keep in mind it’s a team performance. I think that the backs would like to improve their conversion rate, and turn pressure into points. It will be great if the backs make a good impression this weekend, but again the pressure rests with the forwards to lay a solid foundation. I feel it might well prove an open, fast-paced game with both sides looking to play with width. I think Australia are keen to play more of an attacking brand of rugby, and the Boks are intent on converting pressure into points. I think we may see some exciting rugby this Saturday. It’s exciting changes for both teams at flyhalf. Johan Goosen has shown what a good player he is. He will come out in his run-on debut full of fire and excitement. His opposite number, Kurtley Beale is a world class player and will keep the Boks guessing the whole game. Therefore, it will be key that our defence remains intact. Morne Steyn has been under some pressure, but I think the break will do him well. Now that I’ve been injured, I realise how much it means to take some time off from the game mentally. It’s not easy dealing with all the pressure when you’re in the situation, but it’s part of the game and something you have to handle. You need a strong character and most importantly, you need to know where you’re headed. You also really have to decide who you want to listen to. It’s key to stick to the people close to you and focus on your own goals. The breakdown battle always has a huge influence on the outcome, so if we can force a few turnovers and be clinical in our execution, I feel we can get the upper hand in the game. I think Duane Vermeulen’s been doing really well. I felt sorry for him coming into the side straight after injury, but he is a quality player and has slotted in well. I think he will make big impact for the Boks. I don’t know where the game will be won or lost. My guess is on the scoreboard! But jokes aside, I think the Boks will win by more than six points. Turning to the other clash this weekend, I think it’s going to be an uphill battle for the All Blacks in Argentina. It’s going to be a very tight affair, and it would be great if the Pumas could knock the All Blacks over. The Pumas are really going to come out firing and if they can get ahead quickly on the scoreboard, they can really make life difficult for the All Blacks like they did for us in Argentina. I don’t think the All Blacks have the edge upfront. I think the packs are evenly matched. I also wouldn’t say New Zealand is the dominant forward pack in the competition. Our pack enjoyed the upper hand in Dunedin. Coming back from injury, Dan Carter brings a lot of experience and composure to the side, but if the Pumas are able to get under the All Blacks’ skin, they will make life difficult for them. I would actually like to put my money on Argentina to sneak home by two points! Pierre Spies has played 50 Tests for the Springboks and is captain of the Bulls. 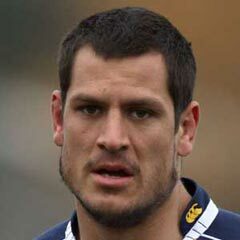 Follow him on Twitter @Pierrespies8.